This week marked the three-year anniversary of me starting my design side hustle whilst working in a full-time job – a venture which eventually lead to me being a creative business owner. I didn’t realise at the time but it was the start of an epic and exciting journey for me which has lead me to my dream job and dream life. 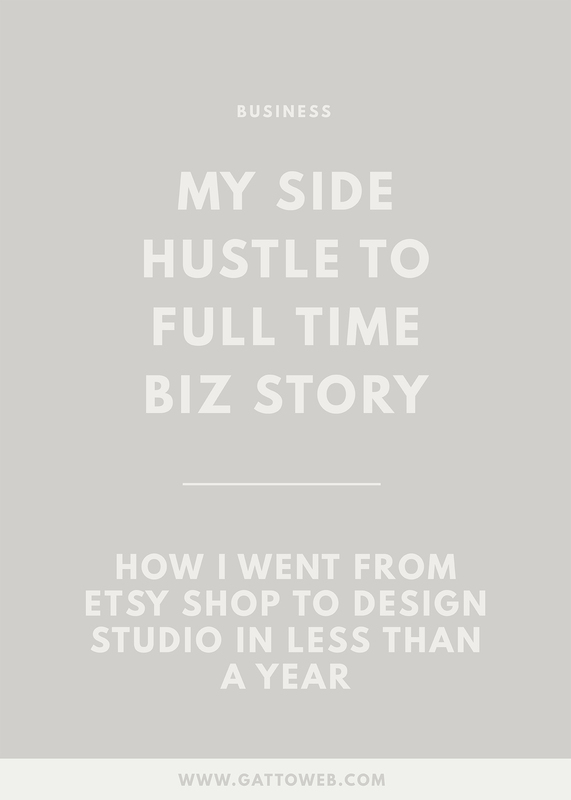 I’d like to tell you the story of how I started my side hustle and how I eventually made it my full-time job and became my own boss. I’ve always been a creative person from making finger paintings to Art GCSE and Photography A-Level but this was sadly cut a little short when I went to university to study Maths. Luckily, whilst studying I found a creative outlet through blogging (under the name je Suis Cat) and I put all my artistic energy into that. I tried my best with my photography, my writing and coming up with interesting post ideas but I always felt something was lacking with the way my blog looked. Armed with a basic knowledge of coding which I taught myself at aged 14 on Piczo (does anyone remember Piczo?) I decided to sit down and create my own blog design. After changing the design around a few times, I realised that no one was really creating their own designs so I wanted to create a few designs which people could use themselves. And Je Suis Cat Designs was born! When I finished university, I got myself a full-time job working in SEO and Digital Marketing which I enjoyed but I wanted to continue with my designs in my spare time. After a few months of just putting my designs on my blog for people to get hold of I decided to get serious and start trying to sell them. I rebranded and became Gatto – the brand that exists today, I created a website on Big Cartel, I made an Etsy account to list the templates on and I started marketing my designs on social media. By this point, I had been using every spare minute I had in the evenings and at weekends to teach myself everything about code and design and learn as much as possible and I was getting pretty good at it (if I do say so myself)! Because of this, I decided to start creating custom blog designs for some blogger friends and also branched out into a few different platforms. My style kept evolving and improving and I loved every second of the design work I did. People started telling me to put my prices up and introduce more product into my blog shop so that was that! My prices were boosted and I started selling premade logo designs and branding packages as well. By this time, I was on to my third workplace after a redundancy and a lacklustre job and I felt deflated and unsatisfied with the work I was doing. I wanted to spend all of my time designing for my ever-growing client list and my motivation at work was at an all-time low. In June 2015, I received the news that the company I was working for was moving its office down to London (away from my home in Manchester, 200 miles away). Although it was terrible news for my colleagues and I was on to my second redundancy in as many years, I couldn’t help but get excited. I knew the job I was in wasn’t for me and this was the sign that I could go and do something else. After spending a couple of months looking for design jobs with the knowledge that this is the only area I wanted to work in, I realised my lack of work experience and a relevant degree was holding me back. I had a long conversation with my family and ever-supportive boyfriend and realised that I had to give it a go on my own. I had the foundations of my business laid already in my Etsy blog shop and website, and I knew if I had the time to spend on it, I could build something successful and fulfilling. So, I went for it. Whilst everyone in my office was job hunting, I calmly stated that I was going to go freelance. I got a few unsure responses and confused looks but I just knew it was what I wanted to do. The day after I finished my job, I jumped straight into my business. I registered as self-employed, relisted all of my design products and started working on new designs. I wanted to put everything into the business which I had taken a chance on and there was no way it was going to fail on me. I pulled out my little book of influencers (I don’t think this is a real thing) and decided to start my marketing efforts with what I do best – designing. I created websites and logos for people in the industry I wanted to target for little to no cost to build my portfolio and make sure I had work to show people who wanted to work with me. Within three months I was getting consistent clients in branding, website design and blog design and I was absolutely loving it. Nearly two years since I decided to take my biz full time, I am still loving every minute of it. I think I have always been perfectly suited to working for myself as an introvert and organisation queen and it is by far the best decision I have made. Although I never had to make the decision to quit my job like a lot of other people, I feel like the universe made the decision for me and allowed me to become the person and business owner I am today. Did you start your business as a side hustle? If so, what made you change to full-time?